Early autumn harvest time. The design is from 1939-1940 by Kyoto artist, Tomikichiro Tokuriki, published by Uchida Bijutsu Shoten 内田. 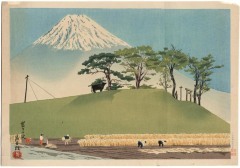 It's Number 13 from Tokuriki's series "Thirty-Six Views of Mt Fuji" 富士三十六景 - this view is titled "Fuji from Honsen" 豊年の富士 - this example is a later printing from about 1965, based on the publisher's seal in right margin.